I often make up garments twice, or more often. If a garment suits you and fits well, why not make it again? I think this is especially the case when you have done a whole set of alterations to make sure a dress or jacket fits well. 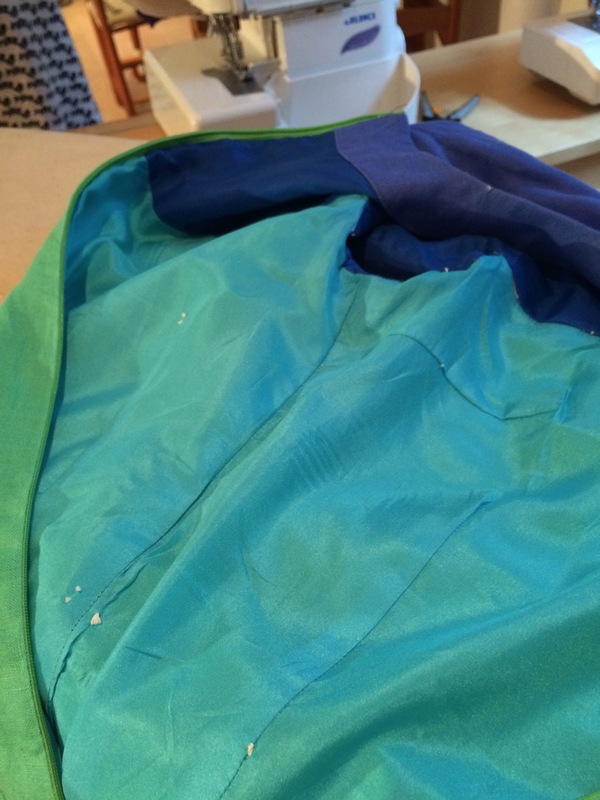 This is the TNT (tried “n” true, or tried and tested) approach to sewing. So I was pretty keen to have another try with this dress (the first version, underlined in organza, was unbearably scratchy). Making a second version allowed me to make a few amendments, proposed by my readers. So I did as you suggested, making the dress both slightly more fitted, and slightly shorter. I did this by incorporating one front dart and two in the back. I got the lengths from Winifred Aldrich – the dart width was either 2 or 3cms at the waist. This one is not underlined, and immediately the wrinkliness of the linen shows. I had only been wearing this dress for about 20 minutes before I persuaded my husband to take a photograph. To me this is how linen looks. I am not bothered. It is lined in silk (two tone, don’t you know?). As you can see I often go out with tailors’ tacks in my clothes. It gives me something to do when I wash and press them. The light weight of the dress, and the luxurious lining, plus the loose-fit made it supremely comfortable, yet smart enough for a day at the office. The darts I introduced were not extreme – as you can see there is still a fold at the waist and the belt is not done up tight. I made the skirt just another inch shorter, which I feel is enough. I do wear shorter skirts, but only in winter, with tights. In summer I prefer to let the air circulate. It is still nice and baggy/comfortable, and I think it still looks like a 1960s dress. It probably needed more appropriate footwear to look authentic. Any further feedback? Do I have to make a third one? The fit is good. Have you considered underlining linen dresses. It reduces the creasing, especially after a full day at work. One of the qualities of a dedicated sewer – tenacity! Let the linen wrinkle that’s it’s best quality. Make a third for your own enjoyment no further alterations needed. Perfect fit with the slight darting at the waist! I would avoid underlining in a linen dress too – its a fabric worn for lightness. That looks spot on. A third is only needed in order to make it up in double quick time knowing it is going to look fabulous. I love the linen, and the creases only show what great taste you have in summer fabrics. Very nice and I like the way you’ve styled it. Apologies for this x-factor quote but I think you nailed it. Nailed it! Maybe Pinned it would be more appropriate! Thank you Annie. Thanks so much Stephanie. I put that belt on – Nick suggested I try a bright blue one. I was dubious, and we both agreed when I tried it – far too much like a uniform. The neutral grey looks much better I think. I love bright colours but I think they need toning down a little bit – otherwise it is the airhostess/star trek look. It’s perfection! A third one…only because you love it so much and it looks ideal on you!